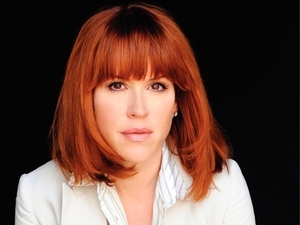 Molly Ringwald’s “novel in stories,” When It Happens to You, is better than I expected. The short stories are connected by common characters and themes of domestic life and inter-personal relationships. Infidelity, regret, broken trust are all accounted for, as well as hopefulness and love. The characters are interesting, as are their lives. Ringwald definitely has something going. Still, you won’t be fooled into thinking you’re reading Lorrie Moore, who mines much the same territory to much bigger impact. Ringwald’s work reads a bit too much like the overly polished prose of an MFA student. Example: In one of the most affecting situations, newly single mother Marina struggles with her six-year-old son, Oliver, who believes he is a little girl, Olivia. In an effort to save Oliver from societal disapproval, she throws away all his girlish toys and clothes and buys him only boy stuff. But it’s like she’s killed the soul of her son, and one day, she makes up her mind to accept him just as he is, and to love him, just as he is. So she buys him a dress and tells the shopgirl it’s for her daughter. Great premise, right? But here’s one long paragraph about the dress she decides to buy. On a Saturday morning in August, she left Oliver home with the neighbor girl, a sweet-natured teenager whom Marina had known since she was a girl, and took the opportunity to run errands. She was waiting at the coffeehouse counter after having placed her order when her eye happened upon a dress in the shop window next door. It was a children’s clothing store named Bees and Buttercups. A broad gilded sign hung above the entrance featuring a pump bumblebee grasping a flower in his anthropomorphic hand. With the school year beginning, all of the clothes on display were imbued with the hopefulness of the new and unknown. The dress was light cotton, with petal sleeves, a pin-tucked bodice, and a silk ribbon tied at the waist. A pair of red leather Mary-Janes were set on the vintage suitcase display next to the dress, delicately crossed at the toes as though in an expression of girlish flirtation. With a story of such promise, why Ringwald chose to fill the pages with so many words of description, I have no idea. The word “anthropomorphic” alone tells you that a red pencil is needed. Her storytelling instincts are strong, her characters are flawed but affecting, and her stories are overly talky and descriptive… resulting in a diminishment of their potential impact. 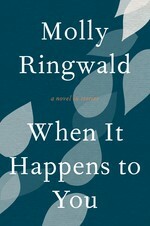 If Ringwald keeps writing, and doesn’t let being a published author go to her head, I have a lot of hope for her. I had pretty much expected that When It Happens to You would be terrible. It wasn’t. This entry was posted in Commentary, Review and tagged actress, author, Molly Ringwald, When it Happens to you. Bookmark the permalink.